Because I grew up in Alameda, I thought every town went balls-out for Halloween. I figured it was an extremely festive holiday anywhere around the world. But then I started hearing from my husband and people visiting that no town does Halloween the way Alameda does. 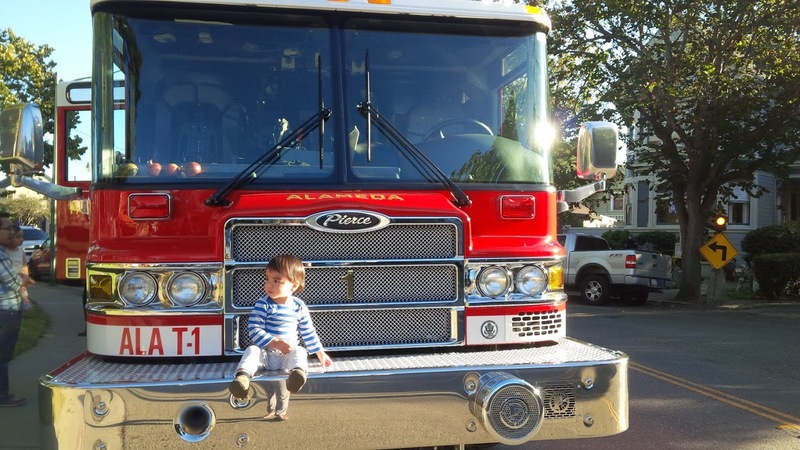 Now that I have a toddler, I am realizing that Alameda is the place to be! There was so much going on, we didn’t get to do everything. Only listing below what we participated in. 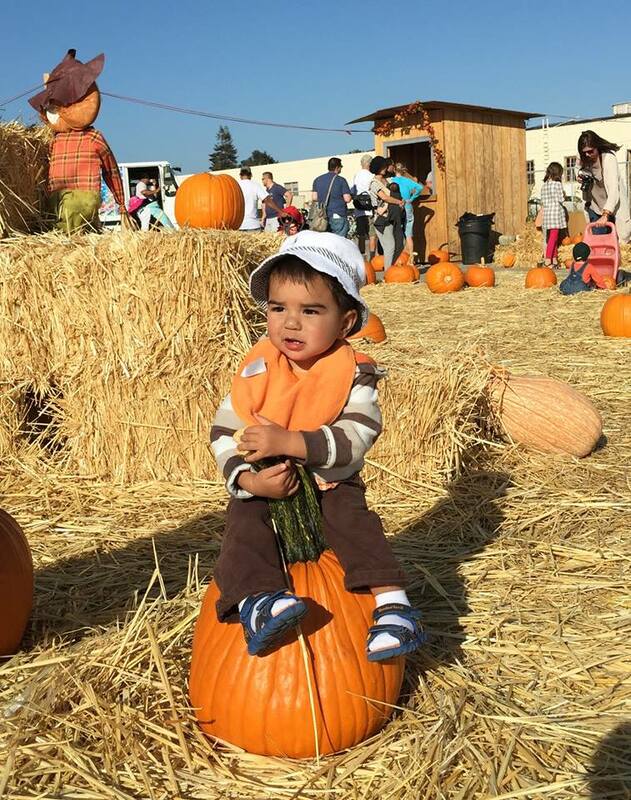 We had our very own pumpkin patch with 4-story slides, bouncy houses, a petting zoo, zipline and food trucks. I drove by one night just before 8pm and there were kids still coasting down the slides. Whether it was the weekend before, the night before, or the day of, kids could get more than their fair share of candy. 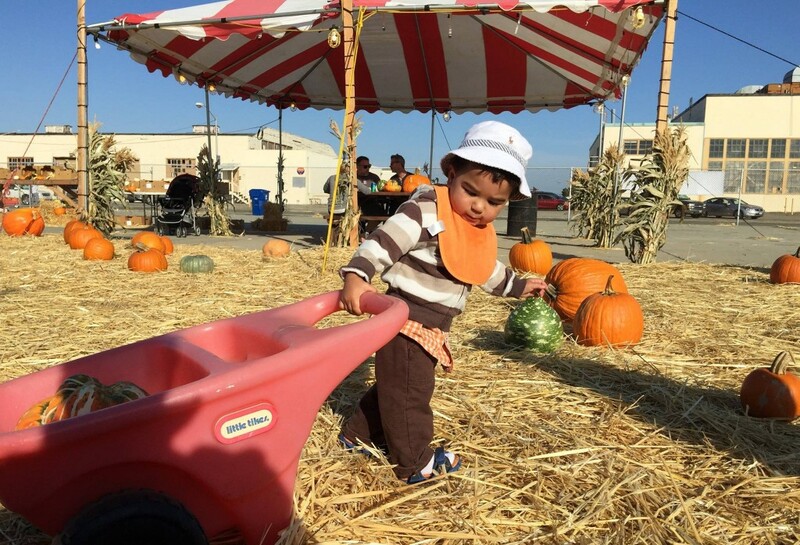 On the day of Halloween, we took Franco to Alameda Landing (the new shopping complex where Target and Safeway are located) to trick-or-treat at the merchants from 3-5pm…perfect for babies who need to go to bed early. The merchants were doling out several pieces per kid and kept asking if we wanted more. In the Sprint store, all the workers started clapping and gave Franco a standing ovation which made him so happy! Every year, teenagers from the Alameda Recreation and Park Department create a haunted house. This year the theme was haunted hospital (think bloody body parts, lots of dry ice, doctors carving up nurses). Before you enter, they ask if you want it to be scary or tame. We had Franco with us so we asked for tame, which probably meant no mental patients jumping up behind you in the middle of the tour. I was cracking up the whole time. Teens have a weird sense of humor. 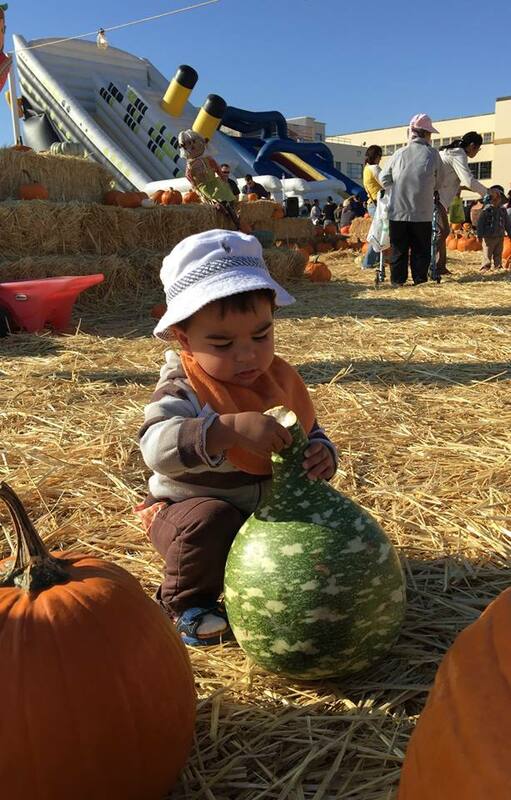 The Alameda firefighters turn one of the local parks into a big pumpkin patch and each child is welcome to take a pumpkin. There was a bubble machine and treats for all the kids. 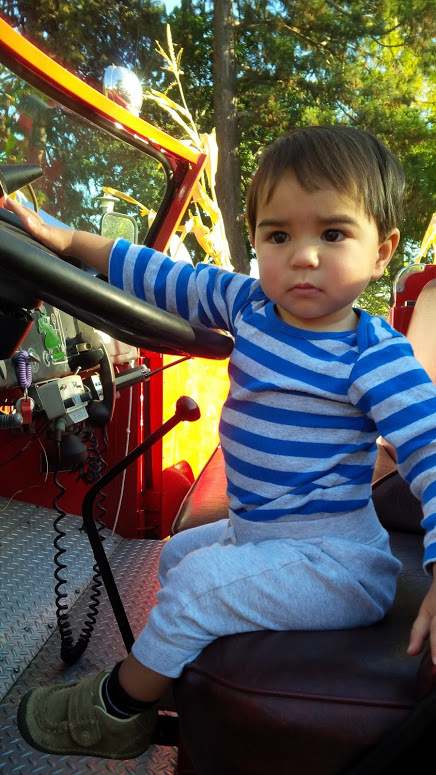 But best of all, there were three firetrucks parked alongside the park that the kids could climb aboard, play with the equipment, take turns at the driver’s wheel. Franco got his chance to play and take pictures, but when the firetrucks drove off, he started crying! This is where Alameda really shines because it’s safe, flat, and has a reputation for being the place to trick-or-treat. Families come from all over the Bay Area to our island town on Halloween. It’s actually difficult to park, so many people descend on Alameda. I wish I’d taken some pictures of the decorated houses, but I didn’t. 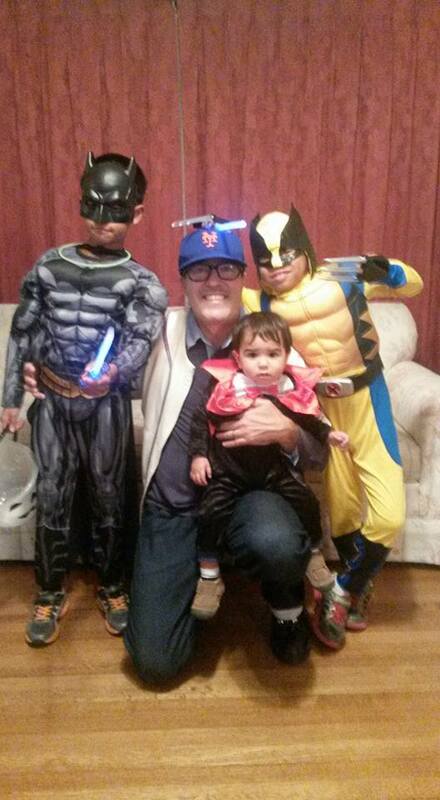 I only have this one of Dean, Franco, and my nephews. In fact, we were told that one home was doling out beers and glasses of wine to adults. Wish that had been on our path! I didn’t even mention all the adult-only parties that were going on in normally sleepy Alameda! It has been a whirlwind October. I hope your Halloween was as festive and fun as ours was. As far as I’m concerned, yes, that’s how it should be! My town totally comes alive on Halloween. It always feels like a movie to me. I grew up on a mountain and we did have trick-or-treating but it was more sporadic. I like walking down the street and seeing 800 people you know in the darkness. Wow, that town does go all out! Franco fits so perfectly on that pumpkin.